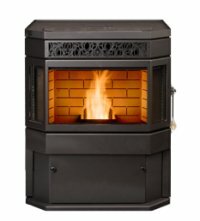 The St Croix Lincoln is a multi fuel corn stove and pellet stove that can burn all types of pellets, corn, wheat, rye, cherry pits & distiller's grain. It won a 'Vesta' award in 2008. The St Croix Lincoln has a separate hopper for the ignition system which uses wood pellets. This allows difficult high moisture fuels from the main hopper, such as corn and distiller's grain, to be ignited automatically. (See Comments below). To cope with high ash levels and clinkers from various fuels, the Lincoln uses the 'revolution' burn pot which is used in the St Croix Revolution furnace. This burn pot breaks up clinkers and dumps the ash as it rotates on a timed system to suit the fuel being burned. Producing 50,000 btu. and capable of heating 2,100 square feet, this is a powerful stove. Both the combustion and convection fan speeds are adjustable. Thermostat Compatible The Lincoln has a built in thermostat, a wall thermostat is available as an option. Window Size 24 ins. by 9.5 ins. Rear Vent Height 16.25 ins. Colours Black, with trim in charcoal, nickel or gold. The Lincoln must be adjusted when changing from one fuel type to another. The pellet ignition hopper level has to be kept a eye on when the stove is cycling on and off using a thermostat. Daily: Check the level in the ash pan, clean the heat exchanger tubes, clean the viewing glass. Twice a week: Empty the ash pan. Weekly: Clean the burn pot as needed. Monthly: Clean the exhaust clean-out ports, clean the heat exchanger baffle, check and clean or replace the air filter. Every two months: Check the exhaust system and clean if necessary. If you would like to leave a review of the St Croix Lincoln, please use the form on the contact page.